Apprentices from across the country aired their views on the programme at a debate in Central London. Reporter Rebecca Cooney went along to watch those at the centre of National Apprenticeship Week have their say. 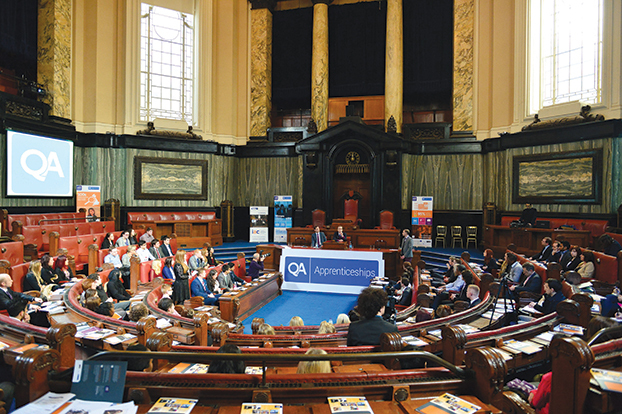 The first ever apprentice debate was organised by the Industry Apprenticeship Council (IAC) alongside the Voice of Apprenticeships conference held by Apprenticeships for England on Tuesday (March 4). It was held in the former debating chamber of the Greater London Assembly, in County Hall. The debate was led by founding IAC member and third year Vauxhall apprentice Lizzie Moffat, who thanked Skills Minister Matthew Hancock for attending. She said: “Events like this are so important for you to make your voice heard. Debate Chamber at County Hall where students took part in the Apprentice debate. Many apprentice delegates said there was an issue with the way apprenticeships were perceived. Another apprentice added that there were problems with how modern apprenticeships were seen by parents and teachers. “At the moment I think apprenticeships are the ‘last resort’ in many people’s eyes, they’re a second chance not a first choice,” he said. One of the major themes of the event was careers guidance as many delegates complained they had not been made aware of apprenticeships at school. “I was at sixth form,” one apprentice told the room. “And every Wednesday afternoon was dedicated to supporting you to fill out your UCAS form to go to university — if you didn’t turn up, you got detention. The experience was reflected by many who said that not only did schools prioritise universities, they did not seem to know about the other options. Skills Minister Matthew Hancock and Ben Pike, Director, QA Apprenticeships. Another said this had been very successful when she had returned to her old school to spread the word. However, one apprentice with Fujitsu said: “Fujitsu has a project planned for 2014 to get apprentices talking in as many schools as possible. 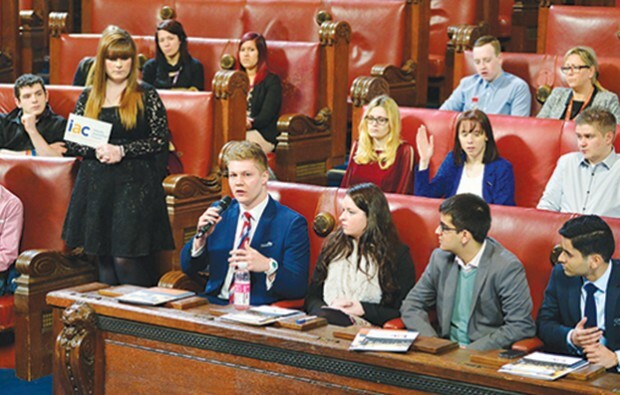 Apprenticeships should also be promoted in Job Centres, one delegate said, pointing out that school-leavers were not the only people who could benefit from the programme. Another topic which drew heated debate was the issue of whether apprentices should be represented by the National Union of Students (NUS). “We’re working, we’re not in education, so our experience of life is totally different,” she said. Another said he did not believe apprentices would be regarded in the same way as university students and said he did not want to be part of the “little brother” arm of the NUS. However, another delegate said: “You are shooting yourselves in the foot if you distance yourselves from students — we may be working, but we are all students and currently we are eligible for membership of the NUS. Every apprentice who spoke was positive about their apprenticeship and the opportunities it offered them, and in a show of hands, the majority said they were hoping to take their learning on to higher apprenticeship level. He also thanked the apprentices for their contributions. “One of the most important things for us is to hear from you,” he said. Mr Hancock said the debate had been “fascinating” and “useful” and praised the apprentices for the articulate arguments they had put forward. I think as a training provider with over 20 years experience of delivering apprenticeship these young people set a very clear picture. Apprenticeship promotion needs to start in schools and the ability for companies like ourselves to actually be able to get into schools has decline especially over the last 5 years. I’ve intuitively known the schools are a hurdle to young people who have a different need to academic progression. To hear it from Apprentices themselves who have overcome their educators prejudice is welcome if worrying. 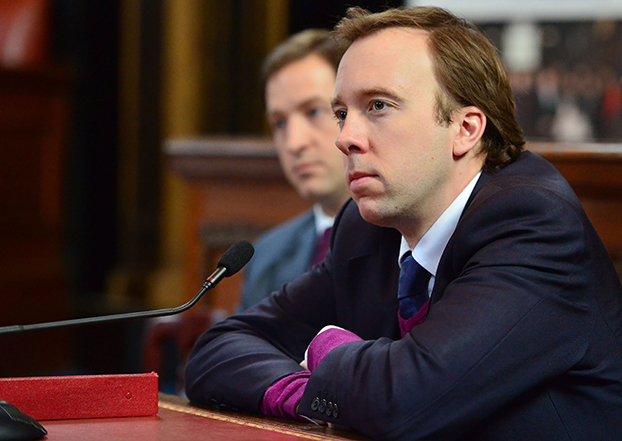 Policy will have to be made to ensure schools give balanced advice. I completely agree with what’s being said here, I’m currently in an Apprenticeship and schools just don’t give the same amount of guidance towards working in comparison to what you would imagine. Schools need to promote equal opportunity in terms of guidance between college/uni/apprenticeships. If you have the Qualifications, I personally believe that an Apprenticeship is the best ruite to go down as the majority of Degree courses give no real-world-experience in a work place.